I have been trying new recipes over the past few weeks (since no longer being pregnant and spending a LOT of time at home) but I'll admit that when I have had a few spare minutes lately, I have chosen sleep over writing a blog post... Yep, there you have it; sleep will always win with me! Anyway... I was feeling the need for some fish with some macadamia nut magic. It baked to a nice golden crisp and went well with some veggies on the side. As always, let me know what you think! 1. Place the fish fillets in a ziploc bag with the coconut milk and let sit at room temperature for 30-60 minutes. 3. Place the macadamia nuts in a food processor and grind until they are coarsely ground. 4. Add in the coconut flour and almond flour and mix well, then transfer the macadamia nut mixture to a bowl. 5. Line a baking sheet with aluminum foil and brush oil on the sheet to prevent the fish from sticking. 6. 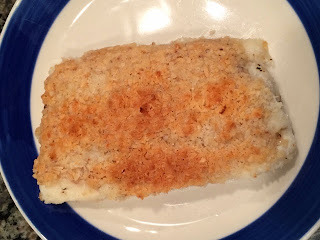 Place the fish filets on the baking sheet and salt and pepper each side of the fish. 7. Place in oven and bake for 5 minutes. 8. Add melted coconut oil to the macadamia nut mixture and mix well. 9. After the 5 minutes, remove the fish from the oven. 10. Flip the fish over and spread the macadamia mixture over the top of the fillets and press it down so it sticks. Then add some shredded coconut on top of the mixture. 11. Place the baking sheet back in the oven and cook for an additional 8-10 minutes or until coconut and macadamia nuts have browned nicely.